Transparency: We fully document the Windows Analytics diagnostic events (see the links for additional information) so you can review them with your company’s security and compliance teams. The Diagnostic Data Viewer lets you see diagnostic data sent from a given device (see Diagnostic Data Viewer Overview for details). Diagnostic data is sent from devices to the Microsoft Diagnostic Data Management service, which is hosted in the US. 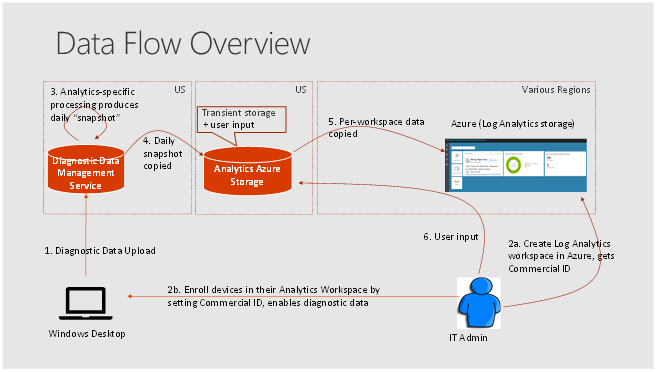 An IT administrator creates an Azure Log Analytics workspace. The administrator chooses the location, copies the Commercial ID (which identifies that workspace), and then pushes Commercial ID to devices they want to monitor. This is the mechanism that specifies which devices appear in which workspaces. Each day Microsoft produces a "snapshot" of IT-focused insights for each workspace in the Diagnostic Data Management service. These snapshots are copied to transient storage which is used only by Windows Analytics (also hosted in US data centers) where they are segregated by Commercial ID. The snapshots are then copied to the appropriate Azure Log Analytics workspace. Can Windows Analytics be used without a direct client connection to the Microsoft Data Management Service? No, the entire service is powered by Windows diagnostic data, which requires that devices have this direct connectivity. Can I choose the data center location? Yes for Azure Log Analytics, but no for the Microsoft Data Management Service (which is hosted in the US).